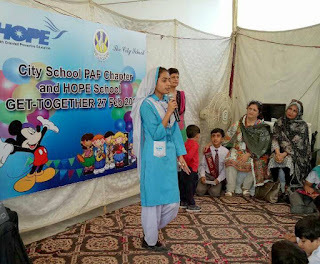 HOPE-a charitable organization in Pakistan, working mainly for the amelioration of women and children has a number of schools and hospitals successfully operating in different parts of Pakistan. HOPE Team USA has been a forerunner in fundraising for different HOPE activities. The education and health sector of HOPE is thriving because of the fund raising carried out by HOPE Team USA. HOPE’s President Mr. Nasar Agboatwalla, visited HOPE School Zia Colony and HOPE General Hospital & Maternity Home Zia colony as well as several Handpumps which are installed on link road Karachi. Mr. Nasar was amazed to see the number of patients touching the sky in HOPE Zia Colony’s Hospital where Approximately 187200 patients are treated annually. 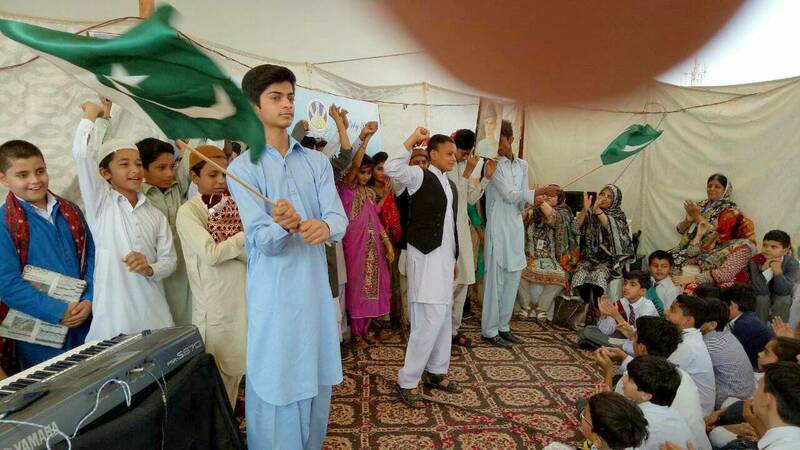 And about 725 students gaining education in HOPE School Zia Colony. Mr. Nasar visited two Handpumps on link road namely Ramzan Road and Gul Hassan Road. The Handpump installed at Ramzan Road benefits 4 villages in its surrounding and 60 families gain access to clean and pure water. Simultaneously the Handpump installed at Gul Hassan road benefits 3 villages and 30 families in its surrounding. HOPE Team USA was overjoyed to see the installed handpumps being extremely beneficial to the village community. They talked with the locals who highlighted how the handpump had saved them from migrating to areas with better water accessibility and reduced the workload on them to fetch water from distant places. Many residents hailed the handpumps to be a great blessing for them. The visitors were showered with hospitality by the locals. 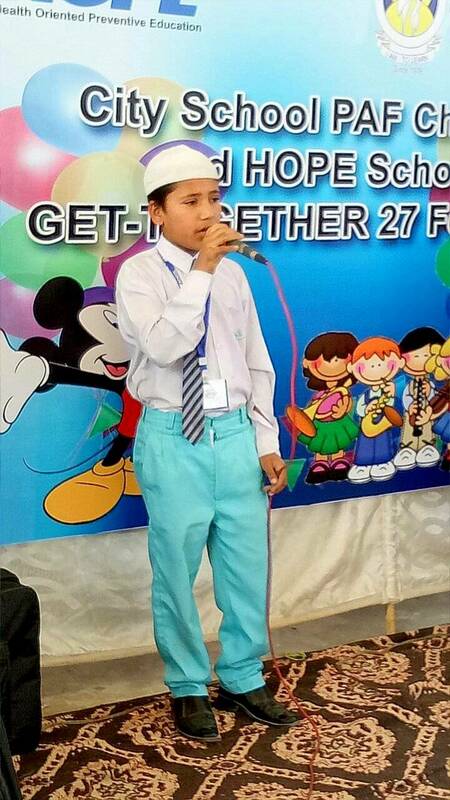 HOPE- an NGO in Pakistan, is highly motivated and dedicated as we witness the growth of the successfully running HOPE Hospitals and Schools. With such positive reviews piling in regarding the Handpumps, HOPE’s President aims to instill more and more Handpumps wherever needed. HOPE hospital in Bilal Colony is one of the very successful maternal and child health centers which treats as many as 26,400 patients. This town in korangi's industrial area takes privilege in benefitting from HOPE Bilal colony Maternal and Child Health (MCH). Women here are highly satisfied with the health services provided free of cost. On the 12th of march, HOPE Bilal colony MCH celebrated its one year anniversary thanks to the generous Sabzwari family. HOPE- an NGO in Pakistan decorated the MCH and the first patient of the MCH was there to cut a cake along with HOPE team USA. Mr. Nasser, The president of HOPE, was thrilled to see the turnout of Bilal colony. Subzwari family even circulated snacks and beverages to patients who were currently present there. Many of them were on drips but they rejoiced on the happy occasion. Bilal Colony seemed to have been completely cut-off from the tide of heath measures being swept across the country after the UN warnings. Bilal Colony has estimate population of around 3 lac with some private clinics installed by the government but due to the shortage of funds and corruption in the government departments, the clinics have not been somewhat established. And that is where HOPE plays a vital role in rendering its services wherever needed, be it Bilal colony or any other underserved area. 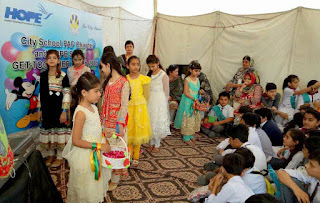 HOPE-an NGO in Pakistan, has been active in Pakistan since 1997, working in the health and education sector of Pakistan. The organization is spearheaded by the dynamic leadership of Dr. Mubina Agboatwalla-child specialist in Karachi and continuously strives to improve the health and educational disparity of the deprived community in the country.HOPE has been a token of selflessness since its inception. 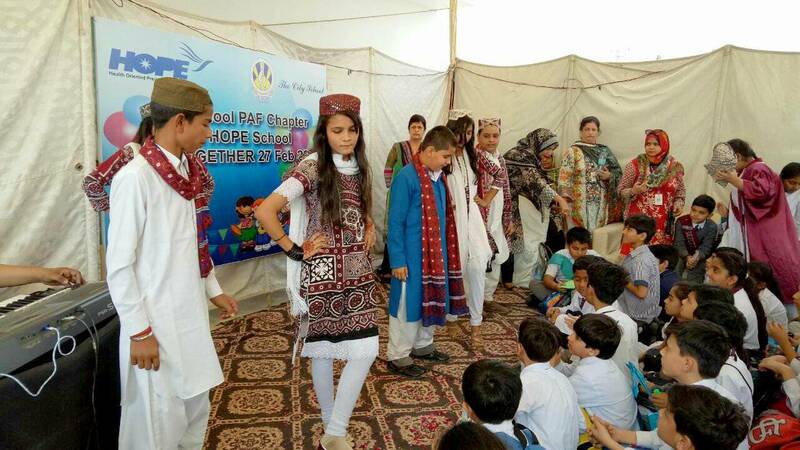 A school along with a hospital, being one of their kinds has been set up in Zia Colony Karachi. HOPE- an educational NGO in Pakistan is currently operating three formal schools in Pakistan, one of them being HOPE’s Zia Colony School. 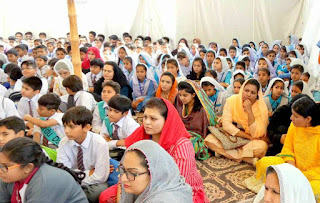 Zia colony school is successfully educating more than 500 students each year with 150 new entrants and welcomes any other institute willing to extend a helping hand. 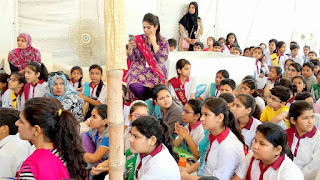 150 Students enrolled in grade 5 of City School PAF Chapter visited HOPE Zia colony along with 15 teachers. The students of HOPE school as well as City school opened the event by preparing 2 separate skits. Overjoyed and ecstatic faces rose to appreciate one another as a token of appreciation. Later on students of HOPE school were distributed gifts which was overwhelming for them in unfathomable ways. 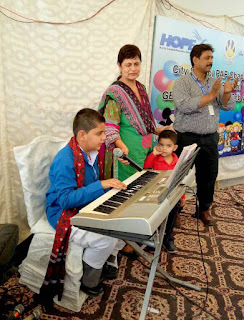 One of the students of City School PAF Chapter, named Sulaiman, also played the piano which added a cherry on the top. Students enjoyed the melodious and soothing tunes and sung songs while playing the piano. All students and teachers were then apportioned lunch boxes and everyone went home with a smiling face which depicted their satisfaction. Students of HOPE School were thrilled to see such bright faces of City School giving them hope to follow through in their footsteps. The HOPE team facilitates any such activity which can be done in collaboration with any other institute in order to bring joy to the underserved population of Pakistan. 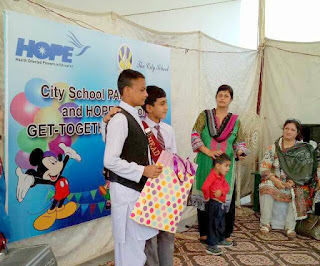 The students of City School have always assisted HOPE Pakistan in innumerable ways. HOPE team is always on a lookout for opportunities where their students can be recognized and their efforts can be rewarded. The acknowledgement and appreciation of our work energizes the team with motivation to put in even greater effort in doing so. HOPE team strives to achieve a greater success rate in the education care sector by the expansion of HOPE school which is fully equipped with all necessary educational facilities. Kashmir is a rural area where health and educational facilities are minimal or non-existent. It is a northern area of Pakistan located in the rocky mountain terrain. In these areas, establishing a school has met up with many hurdles. 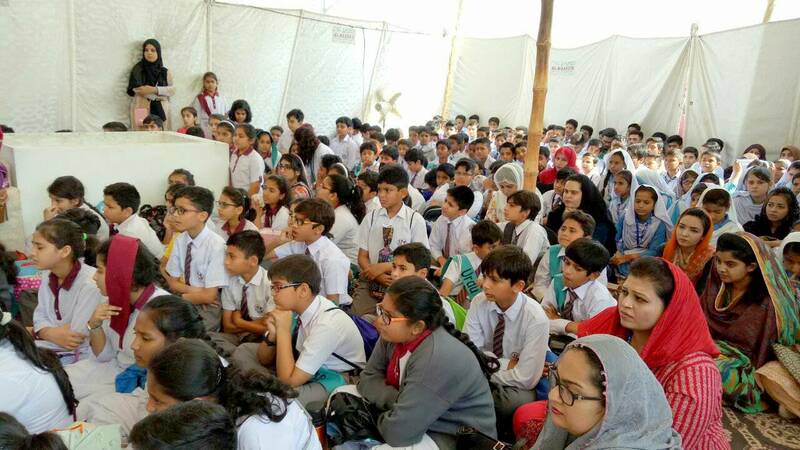 Hence HOPE- an educational NGO in Pakistan, with its determination to educate the underprivileged, has set up schools in Kashmir where the children receive education. With the increasing reputation of the HOPE schools, more people are being encouraged to send their children to HOPE’s home school instead of making them victims of child labor. The HOPE Team led by Dr Mubina Agboatwalla child specialist in Karachi, began their journey in the mountainous regions of Kashmir for monitoring the HOPE schools in AJK and KPK. On the Third day of their visit, HOPE’s representatives went to three of the Goths: Dakhan Karbani educating 55 students, Parhor educating 66 children and lastly Dakhan Karbani educating 45 students. 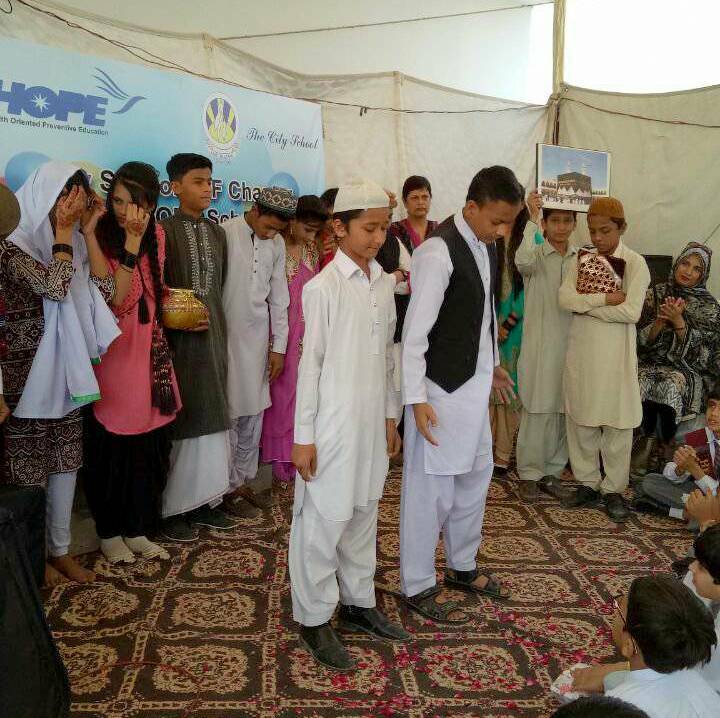 HOPE team was warmly welcomed by students of HOPE schools where pupils performed various activities, role plays and skits. 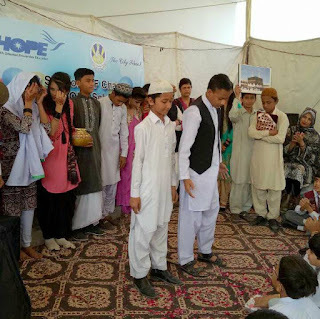 HOPE- a charitable NGO in Pakistan distributed cardigans, suits, toffees, snacks including: samosas, pakoras, juices and pastries. With the passion to serve humanity, HOPE reaches out to all those who no one reaches out to and has established several schools on different mountains of Kashmir. 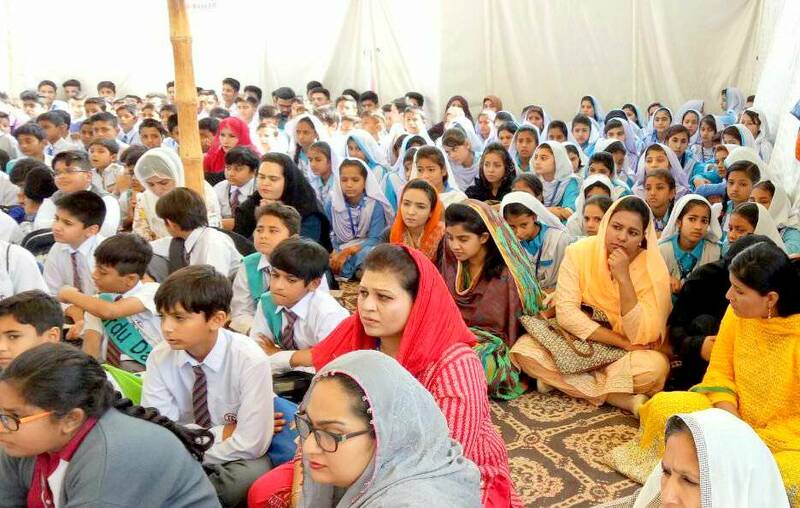 These schools are giving free and quality education to the poor children who cannot even afford to have a sweater or a single pair of socks to prevent themselves from cold even in extreme weather. HOPE serves humanity in ways which are challenging boundaries of helping the poor in the health and education sector. HOPE with its vast assistance spreads joy amongst the people of Kashmir. HOPE’s representatives returned with heartfelt memories of the innocent faces of Kashmir, which they can hold onto for eternity.